Just like in every other aspect of our lives, we’re always looking to make things easier on ourselves. Over the past few years, in the wake of Amazon, more and more retailers are adopting the online shopping trend. So, why should our industry be any different? In 2017, online sales were estimated to be $5,398,230,352 and accounted for 23.2 percent of the promotional products industry total sales. With a back-end system doing all the heavy lifting for you, you not only get to spend more time expanding your business but your customers will enjoy the full benefits of a company store. So, what do your customers get out of a company store? Whether your client is ordering in bulk or shipping to multiple locations, company stores operate a completely seamless order process. With company stores, your clients can have their pre-approved products in an online store, ensuring they get the same products every time. Instead of details getting lost in translation over phone orders, company stores are an easy way for your clients to order what they want any time of the day! Another perk is that since the store is already stocked with their pre-approved products, orders don’t need to go through decision-makers first. If your client has multiple branches ordering products, a company store will guarantee that they will be receiving products with the approved branding standards and price points every time. The appeal behind online shopping is its ease. You can buy almost anything nowadays with just a click of a button. Company stores are available to employees 24/7 and each branch of your business will be able to have their products shipped directly to their location. With an online storefront, the products in stock will always be consistent with your client’s branding. No more “weird reds,” or “old logos” popping up on your clients’ products — their store can be stocked with just the right brand colors and preloaded with their logo. And, what’s great about company stores is that when your client needs to re-order the same products, the employees with access to the company store can place the order online for the exact quantity they need. Your clients will also appreciate that they can also reduce costs by setting up a specific budget or payment plan on their company store. 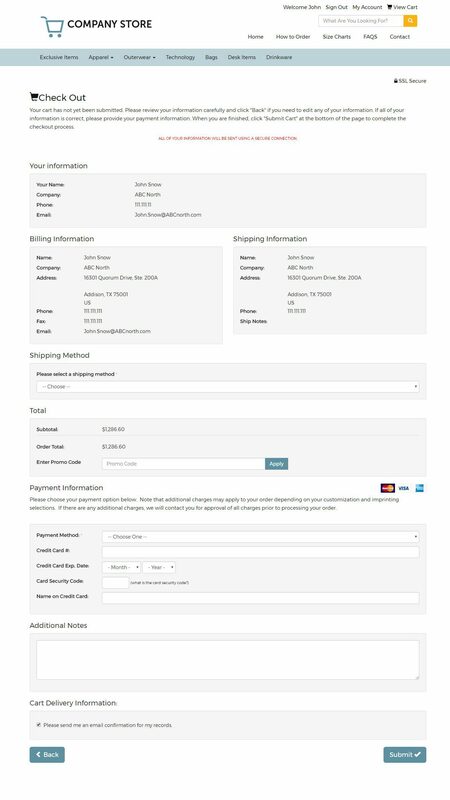 Stores are fully e-commerce enabled with flexible payment options, including credit cards, purchase order numbers, account credit and promo code support. Along with a clean design and navigation, your client’s company store can be customized to their branding requirements. 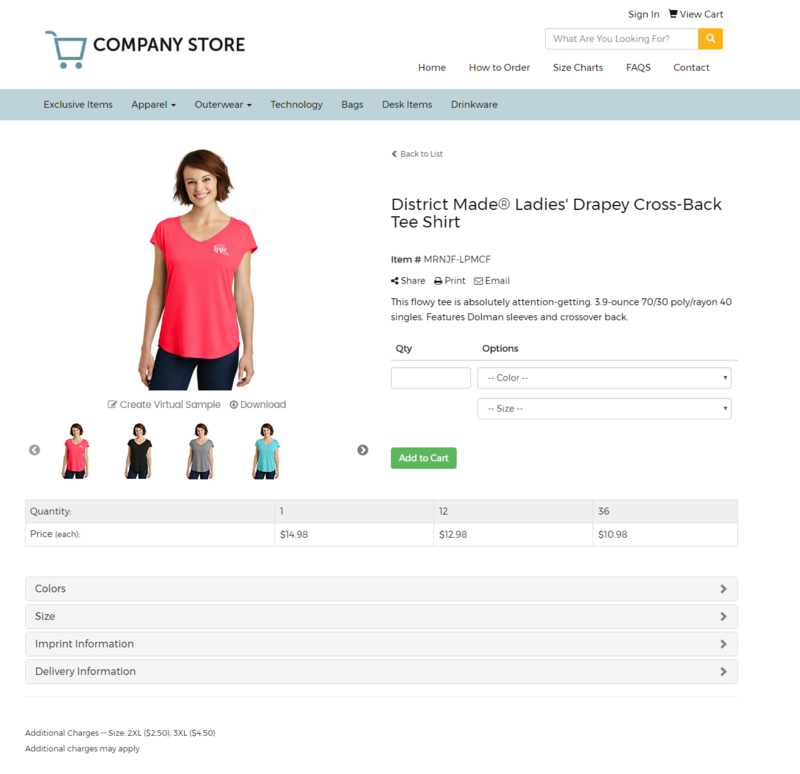 Company stores are equipped with fully customizable product information and photography, as well as an easy to use checkout system. Stores can also be exclusively for employee use or shared with the public. From PANTONE® shades to font sizes, your client will have complete control of their brand. Branded and non-branded products alike can be added to their company store. Branded products fit the needs of company events or company uniform requirements, and non-branded products can be included in the store as a rewards system to employees with excellent performance. They have access to an unlimited number of products to include in their store for whatever occasion. To spark the idea of a company store in your clients’ minds, here’s an end-buyer video that you can share with them! Want to see for yourself? Check out all the features we offer with company stores. 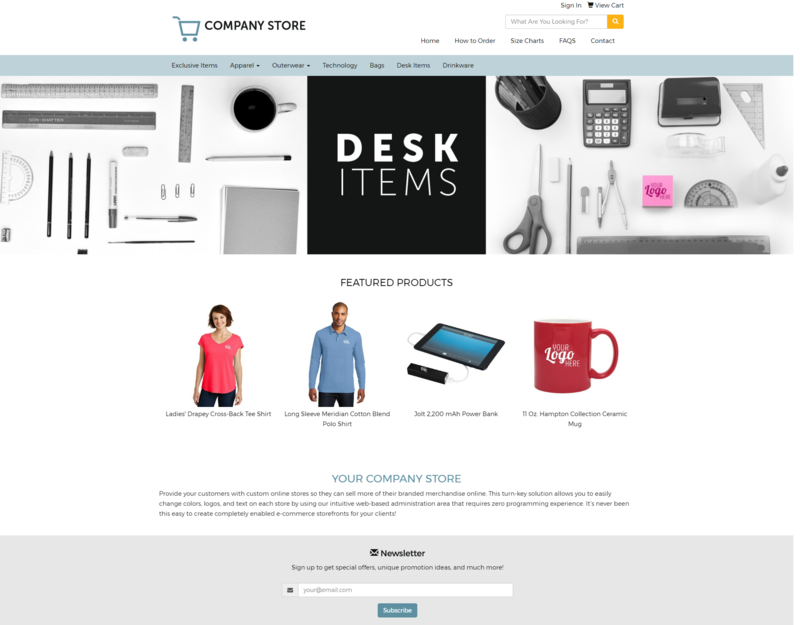 To get started with a company store, contact your account executive today! good work hayley you have talked me into pursuing company stores for one of my clients. they will benefit from allowing their agents to shop on the line. Thank you, H.A. We're excited to help you get your Company Stores set up!